Womens Boots Size 9 / 43 Brown Leather And Suede Lace Up Style. Dispatched with Royal Mail 2nd Class. Size 4 Black Slip On Boots Tkmaxx. Condition is Used. Dispatched with Royal Mail 2nd Class. women black golddigga boots size 6. Condition is New with box. Dispatched with Royal Mail 2nd Class. Women Boots Size 7 New With Box. Condition is New with box. Dispatched with Royal Mail 2nd Class. Women's Black Leather Chelsea Boots with straps UK 5 EU 38 in good condition. Dispatched with Hermes Tracked. 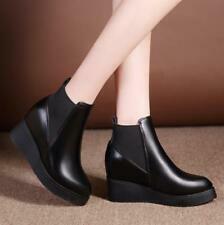 Ladies Black Ankle Boots Low Mid Block Heels Chelsea Zip Up Shoes UK Sizes 3-10. Condition is Used. Dispatched with Royal Mail 2nd Class. Black suede leather upper. 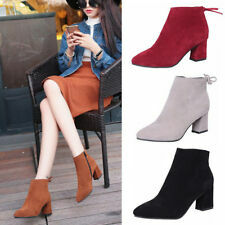 Boot Features Rounded toe. Style - Hi Top Lace Up Wedge Trainer. Heel Type - Wedge. Colour - Black, Silver Clasp. Occasion - Casual, Formal. Condition is Used but plenty of wear left. Hot Pink Chelsea Boots - 60's retro Bowie Size 6 / EU 39. Condition is Used. Dispatched with Royal Mail 2nd Class. Worn a handful of times some small scuffs on the inside of the boot (as seen in pictures) but in otherwise good condition. Pale grey/lilac glittery effect upper in excellent condition. 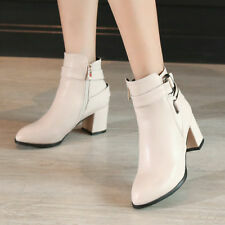 Soft leather boots made in Italy, selling due to change of circumstances. Brand new and never worn. The colour is wine/burgandy red Leather is calf very soft and comfortable Size 43 Length of sole 11 inches (29cm) Original price £200 Would suit formal and casual occasions The pictures shows all details Collection welcomed from London SE21 8BW Any questions please ask.